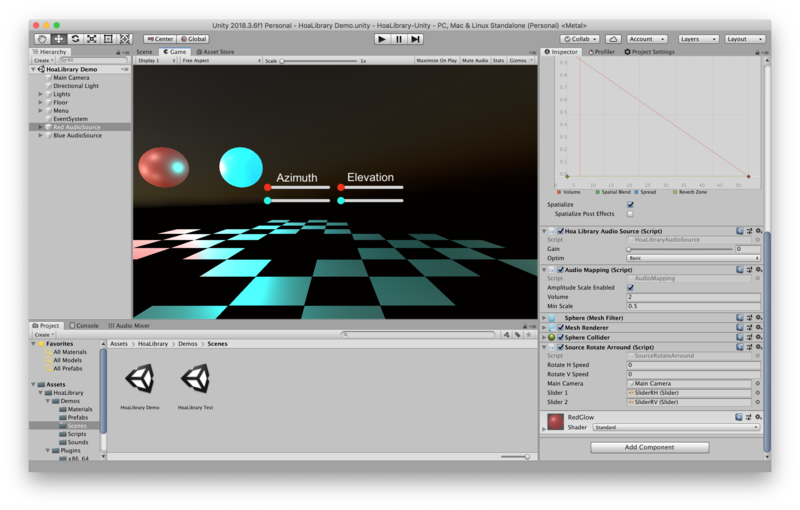 The HoaLibrary plugin for Unity is available for Mac and Windows and supports Unity 2017.1 or newer. Download the latest HoaLibrary.unitypackage from the releases page of this repository. Import the HoaLibrary.unitypackage you just downloaded by using the Assets > Import Package > Custom Package menu. Configure your project to use the HoaLibrary plugin. The AudioSource output must be routed to an Audio Mixer that has the HoaLibrary Renderer spatializer plugin on it. You will find a default one in the Assets > HoaLibrary > Resources folder called HoaLibraryAudioMixer. 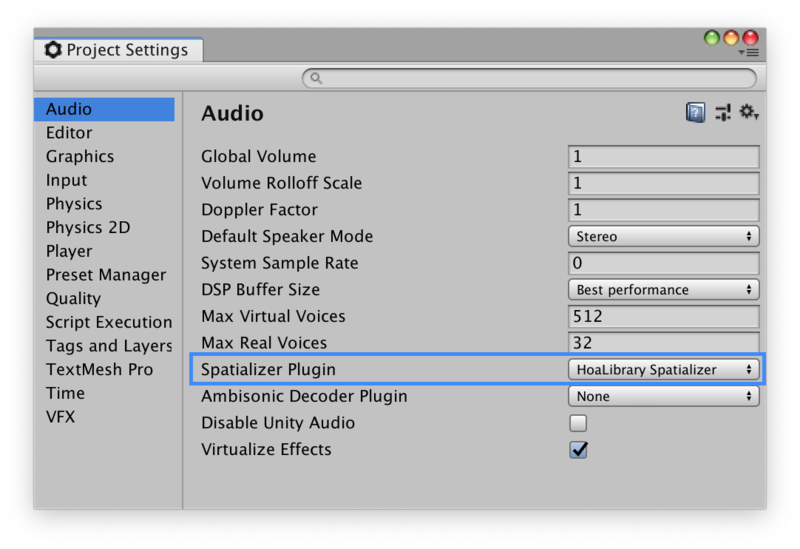 You will also need to check the Spatialize option and set the Spatial Blend parameter to 1. You can, optionally, attach the HoaLibraryAudioSource script (found in Assets > HoaLibrary > Resources) to the object that owns the AudioSource to control some additional spatializer parameters. The Gain can be used to add more gain to this source. The optim parameter sets the ambisonic optimisation to use for this source. MaxRe correspond to the energy vector optimization. You will find two demos in the HoaLibrary package. Navigate through Assets > HoaLibrary > Demos to explore them.